Andre Hayward – Women In Jazz Association, Inc.
Women in Jazz co-featured Andre Hayward in the Legends of Jazz Tribute Concert on Sunday, September 11, 2015 at the One World Theatre, Austin, TX. Born in Houston, Texas in 1973, Hayward’s first exposure to the world of music was through his parents, Melvin and Barbara Hayward where musical talent exists on both sides. Hayward began playing trombone and tuba at the age of 11 under the tutelage of Leon Schreiber and 2 years later with Bob Odneal who was lead trumpeter for Maynard Ferguson. 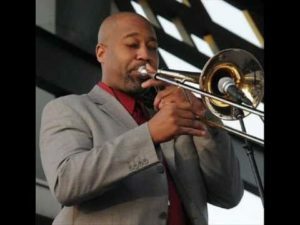 Hayward continued playing through high school where he attended the High School for Performing and Visual Arts under the direction of notable jazz educator,Robert “Doc” Morgan. He continued to hone his skills with Houston’s legendary educator,Conrad O. Johnson. It was Conrad’s instruction, and the opportunity to work in his big band,”The Big Blue Sound”, where he really started to gain experience working in an ensemble.